We are continuing our Summer of Swag Giveaways this week with some goodies from Lev Grossman's Magicians Trilogy. (There's still a little time left in last week's giveaway to win Diana's commonplace book from Shadow of Night by Deborah Harkness). 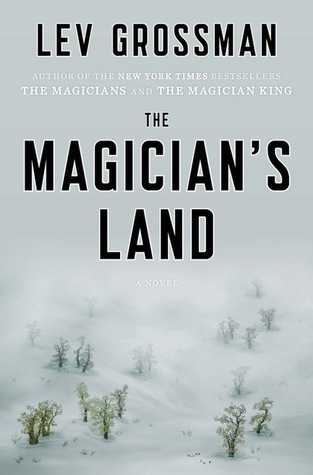 This summer, Viking is thrilled to release THE MAGICIAN’S LAND, the spectacular conclusion to Lev Grossman’s New York Times bestselling Magicians trilogy (On-sale: August 5, 2014; 978-0-670-01567-2; $27.95). The trilogy opened with The Magicians which Junot Díaz called, “Stirring, complex, adventurous…[a] superb coming of age fantasy.” NPR called the sequel The Magician King “a spellbinding stereograph, a literary adventure novel that is also about privilege, power and the limits of being human.” Legions of fans now await The Magician's Land, a novel full of the subversive brilliance that has put Grossman at the forefront of modern fantasy, which will bring the Magicians trilogy to a shattering, triumphant conclusion. Familiar faces return alongside new characters in The Magician's Land. After being booted unceremoniously from Fillory, Quentin Coldwater returns to his alma mater, Brakebills Preparatory College of Magic, to stake out a new life as a teacher. But the past catches up to him, and before long, he and the brilliant student Plum must set out on a black market adventure, taking him to old haunts, like Antarctica, and to buried secrets and old friends he thought were lost forever. Quentin discovers a spell that could create a magical utopia, a new Fillory—but casting it would set in motion a chain of events that will bring Earth and Fillory crashing together. To save them, he must risk sacrificing everything. The Magician's Land is a tale of love and redemption—the story of a boy becoming a man, an apprentice becoming a master, and a broken land finally becoming whole. Old readers will devour the rich and riveting final book, and the completed arc will welcome newcomers who can binge-read the series in full. You can learn more about Lev Grossman on his website www.levgrossman.com and follow him on Twitter @leverus. Girl Who Reads is an Amazon advertising affiliate; a small fee is earned when purchases are at Amazon through the link above. Giveaway is sponsored by the publisher. Sounds different from anything that I've ever read before. Thank you for hosting this tour. Two Cents Discussion: Why Do You Read?